Canada Stamp Packet Collection with White Ace Canada on Stamps Album Pages. All you need to add is a binder of your choice. 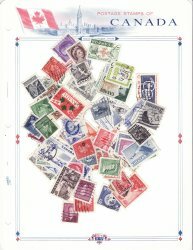 Stamps: This stamp collection of 100 different Canada stamps, is a mixture of stamps, from Canada. This mixture of canceled, used and/or mint all different stamps, may also contain sets. These stamps are an excellent way to begin or enlarge a stamp collection. Scan is an example of the contents of the collection. Album Pages: New White Ace Canada on Stamps Album Pages. Pack of ten (10) colorful bordered pages highlighting the topic of Canada on Stamps, with ample space to create your own layout. 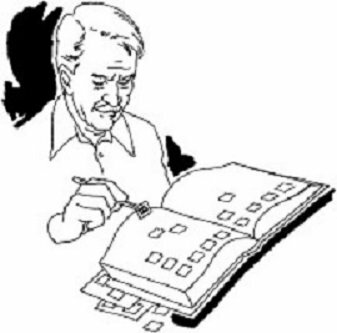 Standard 8 1/2 x 11" page size. 3-ring punched with full color headings. Stamp Hinges: UniSafe Prefolded Stamp Hinges, 1,000 hinges. Hinges are made from a special acid free gummed paper. Prefolded for convenience and to save time.